I’m not kidding when I say I was surviving in Oslo for a whole week. I was still suffering badly from the post-Christmas cold that had me down for a while and having to work in a freezing climate (though it was about 10 degrees warmer than it usually is) didn’t help one bit. Throw in a bout of gastroenteritis and yeah, I’d call it the worst business trip I’d ever had. Norway isn’t a cheap country and eating out is particularly expensive; I believe Norwegians themselves tend to mainly eat at home and only go out for special occasions. As a visitor staying at a hotel, cooking was out of the question and, of course, the only option was to feed myself at restaurants; of course, with all that illness, I had to look at places either on the way back from work or near my hotel. This is a selection of things that I managed to down that week in Oslo. 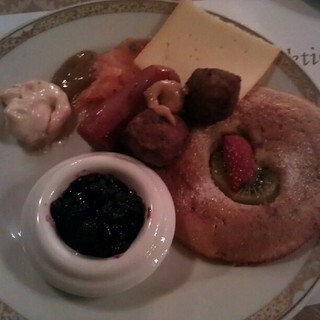 The first night, Iwent to Kaffistova, the “budget” eatery where one could taste Norwegian cuisine. 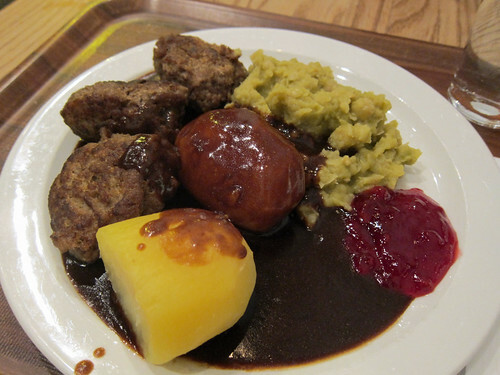 It’s all canteen hotplate food and my plate of 3 large meatballs, boiled potatoes and mashed boiled dried peas cost NOK 149 (the exchange rate was NOK 9 to the pound). It wasn’t brilliant but it filled me up and kept me warm inside. 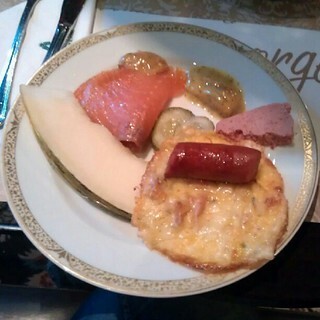 My hotel (the beautiful Hotel Bristol dating back to 1920) had the most amazing breakfast spread – freshly squeezed juices, pancakes, waffles, omelettes, salmon, herring, sausages, cheeses – there was a lot of stuff! Sadly, for most mornings, I could barely stomach any food. 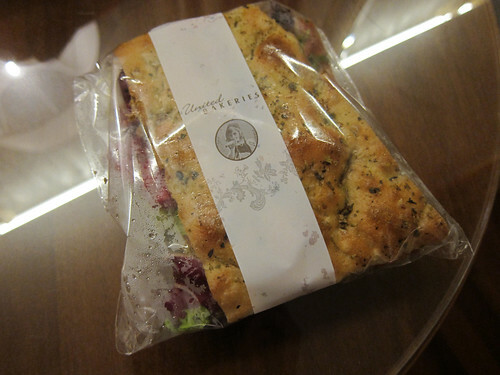 This was my breakfast the first morning. 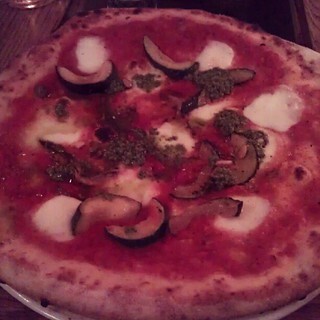 One night, we all went out for pizzas at Villa Paradiso, considered the best Italian restaurant in Oslo. Here, a proper Neapolitan pizza will set you back about NOK 170. They’re certainly very good pizzas but yeah, they ain’t cheap. When I was feeling at my weakest, I made it an early night and grabbed takeaway from a nearby United Bakeries (the branch on Karl Johans Gate). This salami and avocado focaccia sandwich hit the spot. 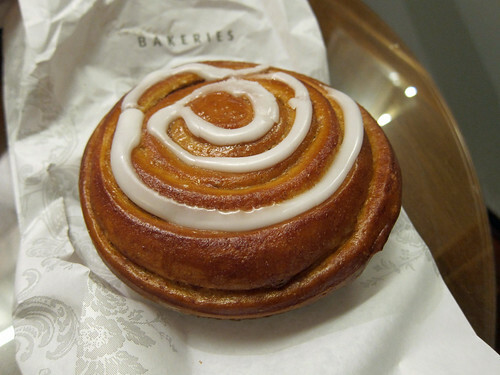 A cinnamon bun from the same place was only ok – it was a bit too hard for my liking. It had likely been sitting out the entire day. 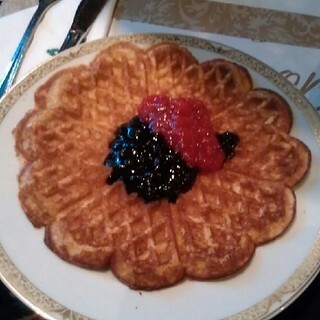 …and then finishing off with a proper Norwegian waffle. These are soft and pillowy and best topped with lots of jam. 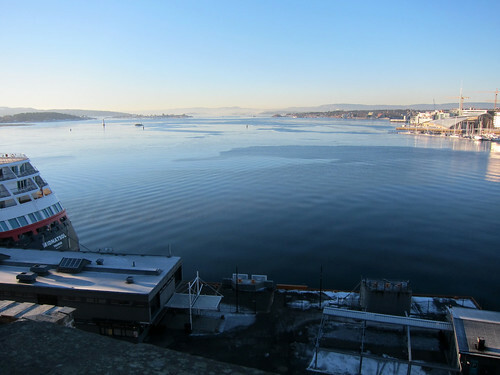 I did manage some sightseeing that last morning, including getting the most perfect view of the fjord from Akershus Festning. Oslo is quite beautiful – which makes up for it being expensive! And their opera house! It’s gorgeous. I couldn’t stop staring at it; it fits so well in this Nordic city. 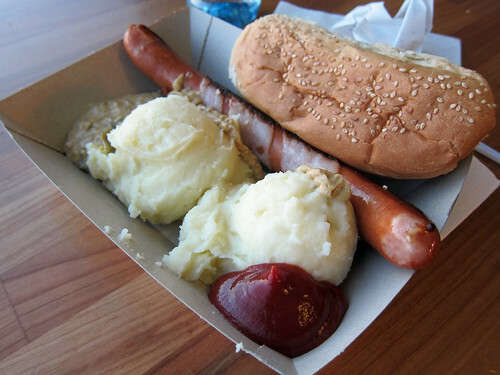 It was then off to the airport where I snarfed down a cheese pølse with bacon… I do love Scandinavian hot dogs. Not exactly haute cuisine but it went down a treat. That was probably not very useful to anyone heading to Oslo! 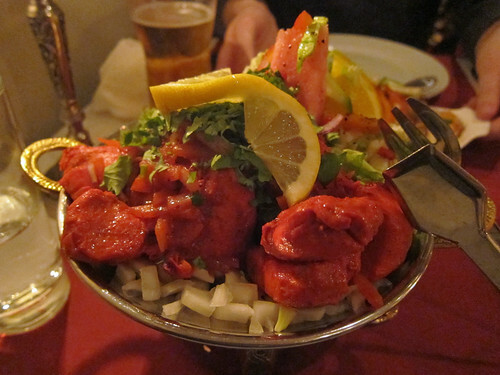 For a proper guide on where to eat out in Oslo, do check out Nordic Nibbler’s list! Mr Noodles has also tried a few places in the city. I guess I do have some tips for what to bring back from Oslo – the milk chocolate there is brilliant. Single chocolate bars are expensive (about NOK 15-20 each) but the huge bars of milk chocolate (with lots of different additions) run about NOK 30-40 (I found lots available at the airport duty free at only NOK 30). They make great gifts – my colleagues inhaled Freia milk chocolate bars with Daim and Kvikk Lunsj. Another nice thing to bring back is ready made lefse, a Norwegian flatbread made with potato. All my photos from my trip to Oslo can be found in this Flickr photoset.